I know I know. 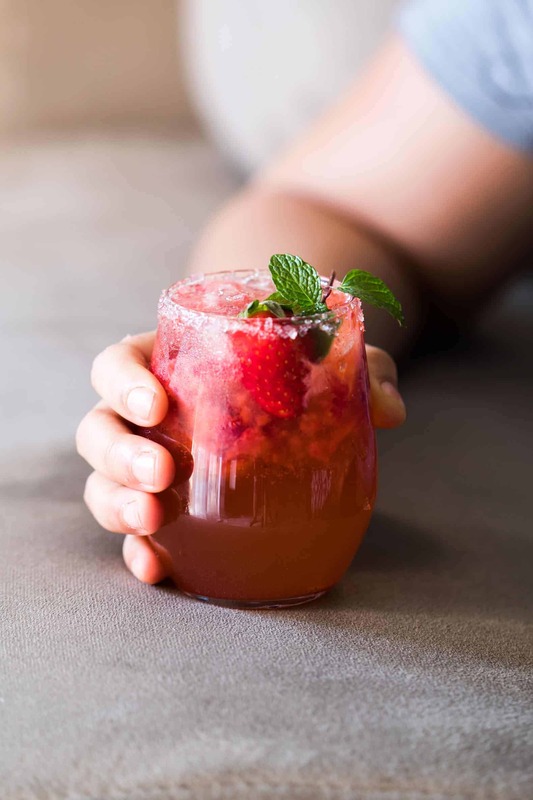 Summers still far away but we don’t need a reason to have a mint strawberry moscow mule riiiighhhhttttt? I’ve been in love with moscow mules for a while now and I am crazy about how simple this cocktail is. By the simplest cocktail I’ve made because it’s really so few ingredients. If this is unknown territory for you, here are a few fun facts about Moscow Mule to get us started! When and How was Moscow Mule invented? According to Wikipedia (geeky I know), there are two different stories, but the one I like more is about how Wes Price, a bartender was trying to clean deadstock in the basement and ended up mixing vodka and ginger beer . Let’s all take a moment to say thank you to Wes. What’s the deal with serving Moscow Mule in Copper Mugs? Now this is definitely more legit. The copper mug is definitely the most popular way to serve Moscow Mules and clearly I don’t own any, but here’s the moscow mule mug I’ve been eyeing. Copper Mugs have a chemical reaction with the lime juice or any other fruit you use and gives it a super unique taste. They also take on the temperature of the drink and keep it colder for longer. But if you don’t care about all this, just go ahead and serve yours in any glass you have handy! What goes into a Moscow Mule? Well basically vodka, ginger beer , lime juice and ice. It’s really that simple. 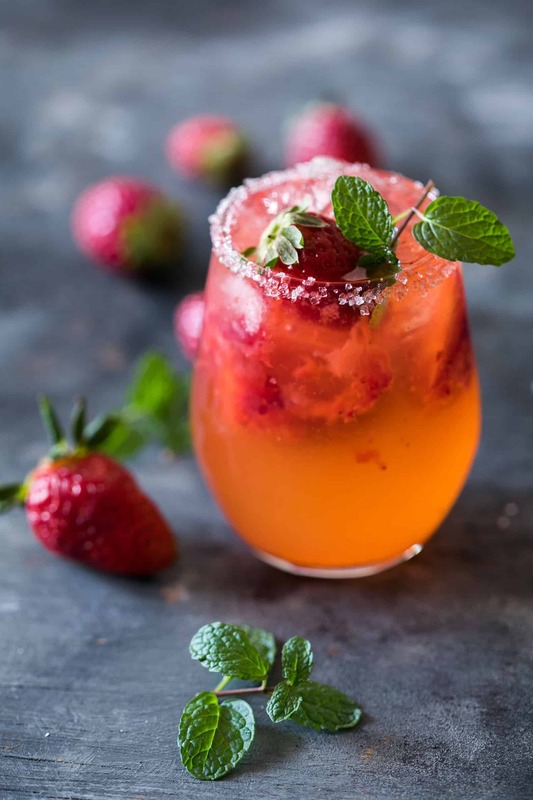 But I don’t like following the rules and so we are doing a mint strawberry moscow mule today which is even better than the original! It so is. 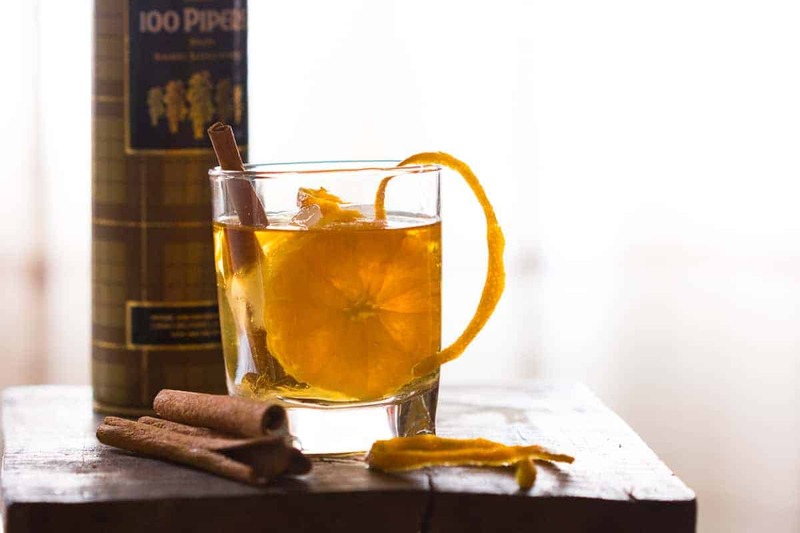 Trust me when I say that I’ve had enough Moscow Mules now to whip up variations like you won’t believe it! I love how chunky this mint strawberry moscow mule is. You get the crunch from the strawberries and the ginger beer with is is a solid combination. We end up doing this with mostly any berry we have on hand but strawberries have to be my favorite. I have a huge thumbs up from the sister who came back from college the other day, saw me shooting these, took one sip and just looked at me like I was God. 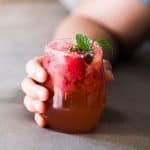 These mint strawberry moscow mules can also be made in a pitcher like a moscow mule punch if you have a big crowd on hand. 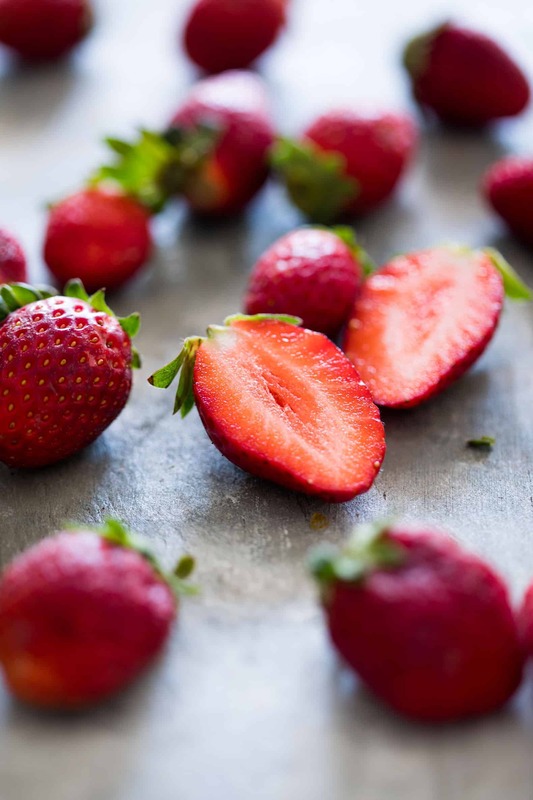 In fact it’s easier because you could probably use a food processor to blitz up a large batch of strawberries, add everything in a pitcher and stir! Though I do think, making them fresh works best. It’s all that fizz in the ginger beer that you don’t want to lose. Are you a mule fan boy? Can we swap more moscow mule variations or should we just stick with the mint strawberry moscow mule? And just one last time, how adorbs are these moscow mule mugs ?! Add strawberries and mint leaves to a glass and muddle till the strawberries are broken down into tiny pieces. Add ice, vodka, lime juice and top with ginger beer. Stir to mix well. Serve immediately. It’s one of my recent fav drinks. Had this at a recent party and it was yum! These are just stunning!!!! Strawberry and Mint is such a great combo! I didn’t know that about those copper Moscow mule mugs. Now I have even more reason to buy some! I plan to get some too! I think this is my favorite twist on a Moscow Mule so far! Awweee thanks for seeing the bright side! Strawberry is my favorite and this is looking delicious. will try this. Thank you very much for this writing. This cocktail looks beautiful! There’s definitely no reason to wait until it’s warm to enjoy. 😉 Cheers! I have to make this ASAP! I fell in love with ginger beer when I was preggo a few months ago and now I still can’t get enough. I’ve made my fair share of Moscow Mules lately but this one looks so much better than what I have been drinking! haha. And the face that it is almost strawberry season… uh yes. I can’t seem to want to drink anything else but Moscow Mules these days! Do you know I have never had a Moscow Mule, you have convinced me to try one and strawberry sounds perfect. Looks amazing. 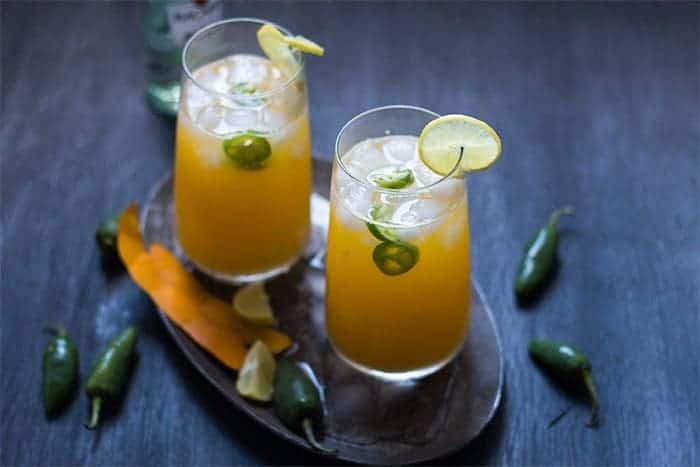 It’s my favourite cocktail these days and I hope you get to try it!